MILWAUKEE, April 15, 2019 /PRNewswire/ -- For the first time, local trade school students partnered with Harley-Davidson® dealers for a unique, real-world training opportunity: helping build the coolest custom motorcycles in the world in the "Battle of the Kings" competition. 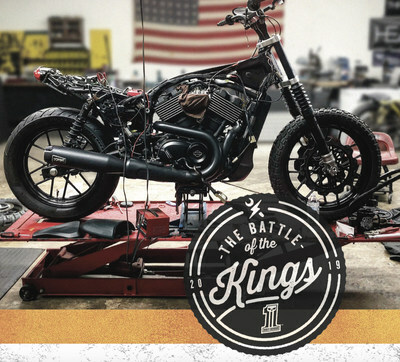 The "Battle of the Kings" competition highlights the endless possibilities to personalize Harley-Davidson motorcycles. It's the largest dealer custom build bike competition in the world, showcasing Harley-Davidson's leadership in customization. Since 2015, Battle of the Kings has created more than 500 custom bikes. "Harley-Davidson's goal is to build the next generation of riders, and those new riders will need service technicians and customization experts to help them along the way," said Heather Malenshek, Senior Vice President of Marketing and Brand. "Introducing trade school students to the unlimited possibilities of custom bike building will unlock their creativity and inspire them to think outside the box as they embark on their careers." The public can vote from a selection of more than 40 rolling works of art featuring the latest in design, fit and finish created in partnership with the students of future automotive mechanics, designers and welders of America. Starting today, the first round of voting, called People's Choice, is open at H-D.com/BattleOfTheKings.